There are many ways you can get involved in growing Baltimore city’s urban tree canopy. 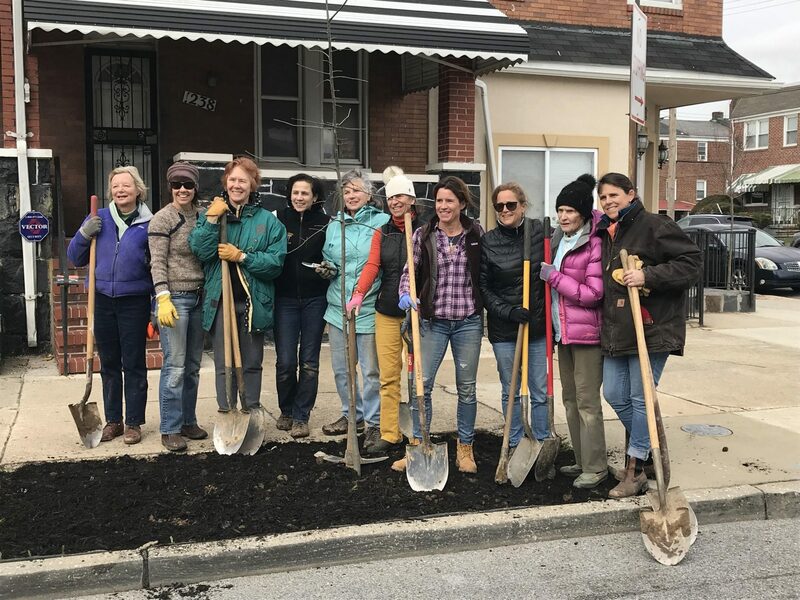 The Garden Club of Twenty planting 25 trees in Berea in Spring 2018. Whether you are just learning about the urban tree canopy or whether you are an avid tree enthusiast, it takes all of us to care and advocate for our city’s trees and green spaces. For starters, we encourage you to simply take note of the trees you see during your commute, on a walk, or outside of your window. You will start to feel an appreciation for the trees that cool and shade our communities, and furthermore, you will notice the streets and parks that live with little to no tree canopy, and can therefore suffer from hotter summers, higher energy costs, and more frequent flooding. We also encourage you to check out some of the resources we offer on our website to learn more about the benefits of the tree canopy. And of course, our team is on the lookout for volunteers, corporate partners, funders, and neighborhood leaders interested in helping us achieve 40% canopy for Baltimore city. Please click the links to the side to learn more about these opportunities for engagement.